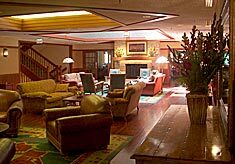 Eagle Ridge Resort & Spa is located just outside of Galena, Illinois, on 6,800 acres of rolling, wooded hills, unique to this section of the Midwest. Along with 80 beautifully appointed rooms in the resort's Inn, there are over 250 two to eight bedroom villas and distinctive homes available to satisfy the needs of visitors of any denomination and agenda. 2009"America's Top Golf Courses Guide;" and Travel & Leisure Golf, Golfweek and Golf Digest have recognized the resort for their 63 holes of award winning golf. In 2008 and in 2009, Successful Meetings honored Eagle Ridge Resort & Spa with the "Pinnacle Award" as voted by readers in the Hotels & Resorts category. 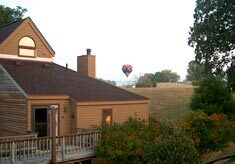 In 2008, Travel + Leisure Golf named Eagle Ridge Resort & Spa the second "Most Underrated" resort in the Midwest and the third "Best Golf Resort" in the Midwest as voted by readers. 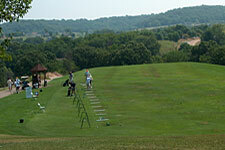 Eagle Ridge offers 63 holes of championship golf. Three 18 hole courses and one 9 hole layout. 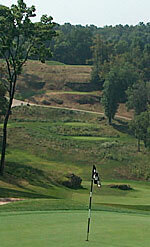 The 18 hole North is uniquely challenging while the 18 hole South provides spectacular play. Both courses ranked among Golf Digest's top 40 resort courses. The 9 hole East course is a tough and has been described as "feisty". The General -opened in 1997 - is the pinnacle of play at Eagle Ridge and is already rated one of the best new upscale public courses and has received 4-1/2 stars by Golf Digest. Each course is located in a pristine environment with flawlessly cut grounds and plush greens. 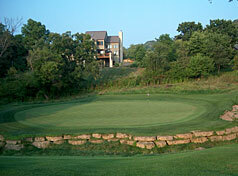 The East Course is a 9-hole par 34 and an excellent test of accuracy, shot-making and putting touch. The General is ranked #6 in Illinois by Golf Digest.In 2009, In 2010, Golfweek named The General one of the best resort courses in the annual Golfweek's Best Resort Courses listing. 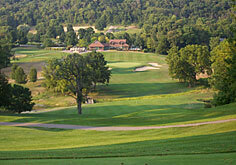 The South Course winds through a beautiful wooded valley where streams and creeks come into play on 11 of the 18 holes. 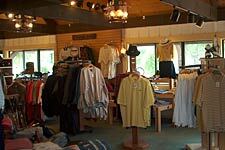 Fully stocked pro shops available at each golf course. The Golf Academy at Eagle Ridge Resort & Spa provides PGA Teaching Professionals and offers individualized golf programs geared to student's differing abilities. Instructors utilize the "GameFit" program to provide comprehensive instruction in all areas of the game: swing corrections, physical fitness, equipment fitting and course management. 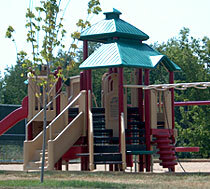 Private instruction, group instruction and \clinics are available. Contact the Academy at 815-776-5201 for more information. 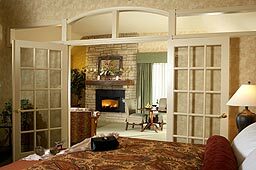 At the heart of Eagle Ridge is a charming Inn with beautifully appointed rooms and suites that are decorated in warm earth tones with timeless furnishings. 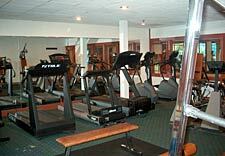 Inn rooms are just steps away from the indoor fitness center, swimming pool and many other amenities. 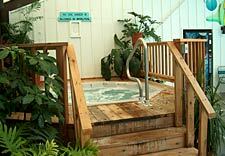 Choose from rooms with two queen beds or one king, whirlpool bath, king bed and separate seating area with sofa and TV or a king bed, fireplace and seating area with sofa sleeper. Luxurious fireplace rooms have walkout balconies. Distinctive Homes and Villas offer you more seclusion, while giving you full access to all the Resort amenities including the fitness facilities, pool and preferred golf course tee times. Spacious and beautifully furnished, both the villas and distinctive homes include central air conditioning, limited daily housekeeping services, grocery delivery, wood-burning fireplaces, fully equipped kitchens, microwaves, a gas grill, TV, VCR and/or DVD player, complimentary "welcome" coffee and wireless high speed internet. Villas are available with one to three bedrooms (some include access to a shared semi-private outdoor swimming pool), while distinctive homes are available with three to eight bedrooms. 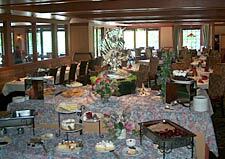 Woodlands Restaurant & Lounge - Experience elegant and family dining while enjoying the magnificent views of Lake Galena. Woodlands Restaurant offers traditional cuisine with a Midwest flair. Steaks, seafood and a specialty menu that changes frequently. The resort's lavish Sunday brunch is incomparable anywhere in the tri-state area. Spikes Bar & Grill - Dinner features fresh seafood, steaks and Midwest regional cuisine in a breathtaking setting overlooking The General Golf Course. Specialty beers on draft and a full bar menu are featured at Spikes Bar. Spikes also offers a menu of salads and sandwiches for lunch or after golf. Open seasonally. Paisanos Delizioso - Enjoy piping hot pizza, Italian sandwiches and salads at our Italian-style cafe - eat-in, take-out or delivered to your home or room in The Galena Territory. The Eagle Ridge Coffee Shop - The Eagle Ridge Coffee Shop proudly brews Starbucks coffee daily. Host all your meetings where rave reviews are the normal accolade, and let knowledgeable meeting, catering and golf professionals make your next meeting a spectacular success. Acclaimed for hosting superb meetings and events, Eagle Ridge Resort & Spa rises above the rest with extraordinary space and service. 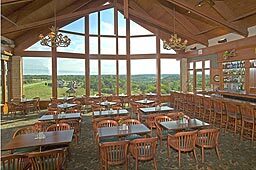 Surrounded by unparalleled natural beauty in Galena, Illinois - and featuring the finest golf in the Midwest and facilities to match - it is the ideal setting for your next meeting, conference or business event. 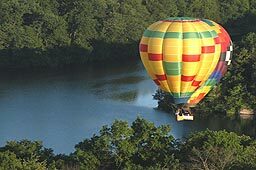 Eagle Ridge's professional meeting coordinators specialize in creating the perfect event, whether it's a conference, meeting, party, wedding or other special event. 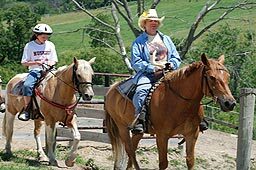 They will also work with you in creating team building programs and group activities such as tournaments, team sports, scavenger hunts, casino nights, special dinners and entertainment. The best kept grounds outside the greens may be our spectacular meeting facilities. With 15,000 square feet of function space, 14 meeting rooms, with three executive boardrooms, we have the perfect space to suit your needs. And each of our 14 exceptional meeting rooms takes advantage of the scenic landscape, with walkout patios or terraces overlooking Lake Galena and the surrounding hills. Contact the staff at Eagle Ridge for more information on hosting a meeting or a conference. From Chicago: Travel North on I-94 to I-90. Travel West on I-90 to I-20 (Rockford Exit). 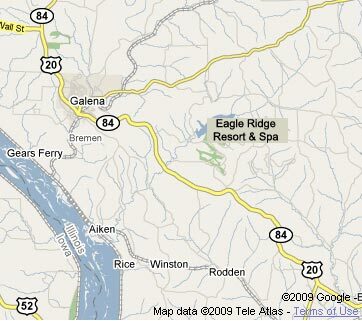 Travel West on I-20 to Eagle Ridge Inn & Resort (approximately 11 miles past the town of Elizabeth.